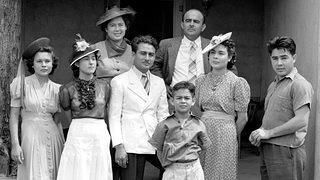 Pedro E. Guerrero (pictured right) with his family in Mesa, Arizona, 1935. What was Pedro Guerrero like? I had met Pedro about 30 years ago through his family. 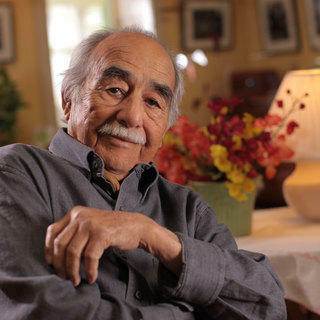 Yvan Iturriaga and I interviewed him in April of 2010. At that time he was 92 years old. He was absolutely charming, a great storyteller. He felt relaxed enough that the camera being there didn’t really matter. It was like a conversation between old friends. Did you have a particular favorite building that he photographed? One of my favorites is that series [showing Wright sipping tea on the site of the Guggenheim Museum] called “Tea Break at the Guggenheim.” You land on that photograph and you really do get the feeling that you’re eavesdropping. There’s also the last sequence of photos of Calder, just before he died. Those are two of my favorites—not so much of buildings, but of individuals. For buildings, some of my favorites are the photos of Taliesin [West], shot in the early days—1939-42. There’s some pretty cool stuff in there. Pedro E. Guerrero self-portrait, circa 1950s, New York City. 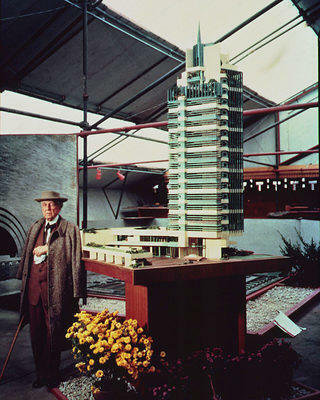 Frank Lloyd Wright at the “Sixty Years of Living Architecture” exhibit on the site of the future Guggenheim Museum, 1953, photographed by Pedro E. Guerrero. What is Guerrero’s larger significance? 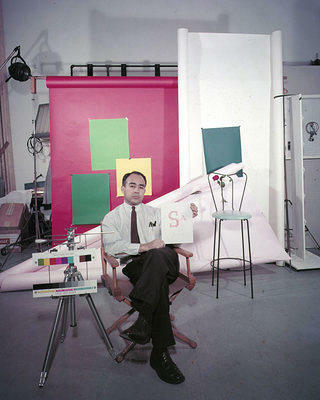 Obviously he was very important in the photography world and the art and architecture world, but why choose him as your subject for this general-interest film? His life and career spanned the 20th century. He lived to be 95 years of age. So he saw a lot. In a way, this is a real American story, told through the eyes of a Mexican-American that a lot of people didn’t know about. But he was a veteran, he experienced a lot of [historical] events, and he gave us a perspective on three major artists of the 20th century that we perhaps wouldn’t have [otherwise]. One of the things I was really pleased about was that I spoke with Tim Wright, one of Frank Lloyd Wright’s grandsons, and he said: “Pedro showed that my grandfather had a sense of humor.” People think of Frank Lloyd Wright as being really serious. I think because he had these close relationships with them, I think he may have humanized [Wright, Calder, and Nevelson] a little bit. So I think that’s significant. Was there anything that came up during the filming that surprised you about Guerrero? There were a lot of photographs of himself. I asked Dixie, his wife, why? She said, you know, he was very concerned with his image. He tried to cultivate an image of himself throughout his life. Here was a man who was trying to figure out who he was and how he fit into the world, and I think taking those “selfies” helped him figure it out. In the film, architectural historian Bernard Michael Boyle talks about how Guerrero was able to bring out the texture of a place. Can you think of a particular example? Anything he shot that’s in the desert, the buildings actually look like they’re [growing] out of the ground. You can see the rocks they used from the area. The black and white photography kind of lends itself to that. Also shooting in large format, you really see detail, and the photographs show really well. We’ve had a few screenings in theaters as promotion for the American Masters broadcast, and the photographs stand up really well, even when they’re blown up on the big screen. They give the feeling that the buildings are of the earth and made with those [natural] materials.